These pups can't get enough of their Puppuccinos. The Starbucks secret menu is pretty much essential to human life, as evidenced on Instagram and pretty much all over the internet. But it's not just humans who are obsessed with the secret items Starbucks has to offer. Dogs also have a secret Starbucks menu item they can't get enough of: the Puppuccino. Basically, it's a mini cup of whipped cream and dogs love it very, very much. Cuties! Looks like every person I know when they get a Frappuccino, TBH. I know the cuteness is overwhelming but before you run to the nearest Starbs to get a Puppuccino for your dog, you better check with your vet first to make sure they can tolerate dairy. 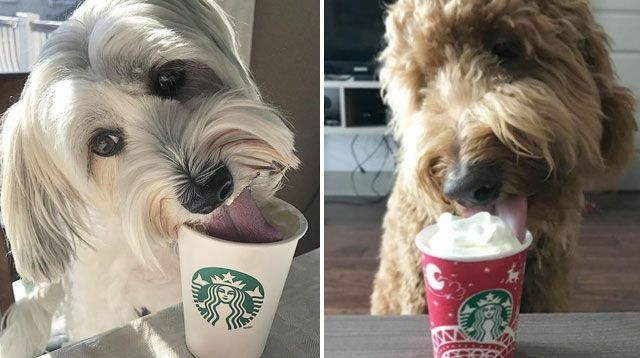 In the meantime, give yourself the distraction you deserve and watch these 15 dogs live their basic, happy, Starbucks life.